The “ottimo” in steam cleaning abilities! Vapamore MR-750 Ottimo Steam Cleaning System is a heavy-duty steam cleaning system used for both home and commercial applications. 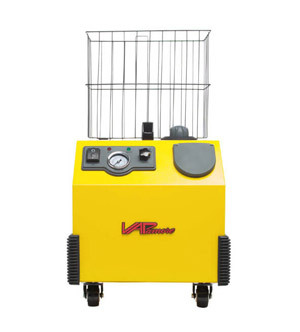 This system was designed to fill the gap between lighter duty home steam cleaning systems, and the heavy-duty commercial systems – making the Vapamore MR-750 Ottimo Steam Cleaning System perfect for detailing! Lightweight and easy to use, the Vapamore MR-750 Ottimo Steam Cleaning System uses a 75 psi max steam pressure, the largest boiler tank available, and a 1600 watt heater. Ottimo is the Italian word for “Ultimate”, and this perfectly describes the Vapamore MR-750 Ottimo Steam Cleaning System! The use of steam cleaning in detailing has changed the way many professional detailers run their business. Since steam is so powerful and adept at removing stains quickly, detailers no longer have to carry around harsh chemicals for spot removal and heavy duty staining. Safe for use on most surfaces, steam cleaning is perfect for use both inside and outside of the vehicle. Don’t like the small size fool you – the Vapamore MR-750 Ottimo Steam Cleaning System packs a steam-powered punch! Featuring a solenoid operated steam control, water level indicator dipstick, and commercial grade contrusction, the Vapamore MR-750 Ottimo Steam Cleaning System acts as a commercial level machine, without the overwhelming size and weight! Vapamore has made a name for themselves when it comes to quality products, and the Vapamore MR-750 Ottimo Steam Cleaning System is no exception! • Boiler Size: 4 L – 1 Gal. • Fill Capacity: 2.8 L - .73. Gal. • Steam Time: 3 Hours Max. • Heating Time Full: 20 min. • Steam Hose Length: 2.5 M – 8 ft.
• Power Cord Length: 4.5 M – 15 ft. I'm a mobile detailer. It makes my job easier, lots of dry steam heat , lots of tools and horse hair brush. Fits in back of my van, Life time warranty is great.